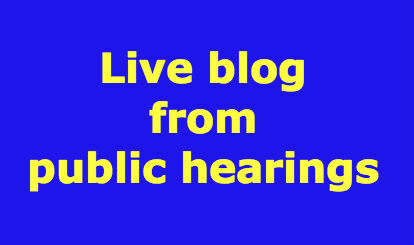 The next expert to present evidence for Moonee Valley was Robin Brown on noise. Brown presented concerns regarding the weaknesses within the CIS such as dealing with a reference design. In order to define adverse noise, Brown refers to standards such as VicRoads, CityLink Concession Deed, AS2107. The CIS states that the noise impacts will exceed the 60dB criterion. Even with mitigation measures noise will still exceed this criterion. The upper levels of the towers will exceed 65db. The CIS therefore proposes architectural treatments will be required. However the CIS also reports that architectural modifications are not possible. Is this acceptable or are acoustics treatments, mechanical ventilation required, or modified sound walls such as curve or tubes. Brown says the CIS should provide a solution. Case Study – Flemington Estate – potential for variation in noise level changes. Brown undertook testing as it was not apparent that tests were undertaken at the Estate as part of the noise studies. Brown predicts that the noise levels will reach 72dB – an increase 5dB, warranting architectural treatments. If the proposed East West Link western section, or freight traffic composition changes, then impacts will increase. Brown proposes that the project establishes triggers similar to that established under the Passenger Rail Infrastructure process. Brown recommends that the trigger levels should have a ‘cap’ of 68dB for both East West Link and CityLink – not just existing noise +2dB. LMA agree. Brown stressed that these were only case studies and other locations may be more adversely affected. WREN – Questions if the readings were taken considering issues of window thickness, open and closed windows etc. A closed 6mm window thickness would predict an internal noise level of what? Moves on to the VicRoads standards and what is the correct current noise level that CityLink operates under and considers if this is the appropriate standards for East West Link. WREN – Provides scenarios where current night time bedroom noise levels could be in excess of 59db; when the current standard is well below this. With open windows they would be even worse. Who should be authority to correct and fix this? How is the proposed East West Link able to meet these proposed limits when existing levels are already above them? PITT (MCC) – Establishes that 60-63db is a reasonable outdoor level. Establishes that this level can be achieved within the project. Establishes that in many cases the only place for residents to have acceptable noise levels is within the parks most affected by the proposed East West Link. Morris (LMA) – accepts the performance requirements of 68db proposed by Brown. The Assessment Committee agrees to consider another expert conclave to analyse traffic issues further – such as the Elliott Ave interchange proposal put forward by O’Brien. O’Brien continues to outline a better way of designing the toll way with far less impact and conforming to safety standards etc. He agrees that micro-modelling will need updating. There are now so many alternative options being proposed we are comparing options with options. Now comparing the O’Brien option with the Higgs (MCC) model. O’Brien does not consider the Higgs model will work at Elliot Ave/ Flemington. Tweedie, for LMA challenges O’Brien’s qualifications for road design. He suggests that O’Brien’s report was only looking at negative aspects of the project and not balanced. O’Brien suggests that the report still has benefits in assisting the panel. Tweedie is attempting to propose EWL benefits to O’Brien, and is inferring that there is a significant demand for commuters from the east wanting to get to and from Moonee Valley. the impact on open space comes mostly from the spacing of entry ramps to CityLink. O’Brien has re-designed several on and off ramps to reduce the land take (and impacts on adjacent areas) and reduce structures in the Moonee Ponds Creek. O’Brien raises road safety problems with design of off ramps connecting with CityLink there is not enough distance between new and existing ramps, not enough visibility of upcoming ramps. Supports Higgs’ option for Elliot Avenue, and Higgs’ options for east to south ramp has merit to be pursued further. Impacts on Debneys Park could be substantially reduced by a design that places southbound East West Link ramps to the east of the CityLink structures. O’Brien has prepared re-designs for Mt Alexander Road/ Ormond Road intersection, Mt Alexander Road/ Flemington Road intersection, and Flemington/ Elliot Avenue intersection to reduce land take and improve public transport, cycling and pedestrian links. Yesterday @jillyfrees tweeted about the lack of snacks, and suggested smarties could be provided at tea breaks. Mysteriously, smarties have appeared today with the tea things. The committee has asked LMA for clarification of traffic figures, including the ‘demons diagram’. 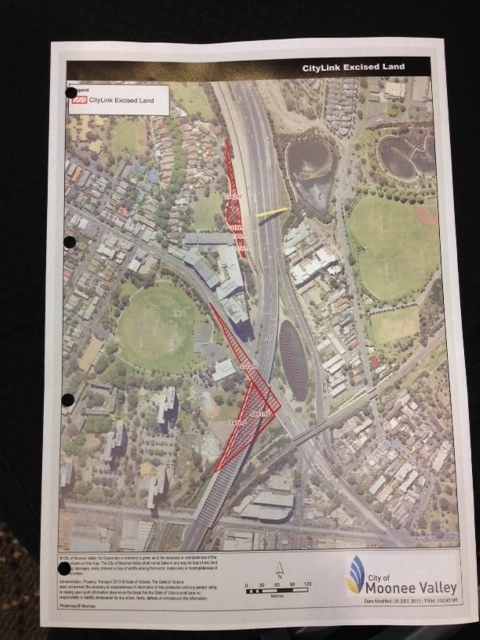 Particularly why the diagram shows a decrease on Yarra Bend Road? LMA says that additional lanes will mean that ‘existing roads’ (they really mean existing lanes) will have less per lane. The committee has asked LMA to prepare a new version of the diagram which classes additional lanes on existing roads as existing roads. Moonee Valley City Council begins by tabling a folder-full of documents about Council’s sustainable transport policy and planning, particularly policies around walking and cycling promotion which establish a hierarchy for road space allocation (pedestrians, cyclists then vehicles), and documents highlighting the lack of public open space in the city of Moonee Valley and policies around the Moonee Ponds Creek. Moonee Valley’s Open Space Strategy highlights that nearly 70% of Moonee Valley’s open space is along its creeks. City of Moonee Valley’s concerns thus far primarily concern the amount of open space currently available to residents within the footprint of the project. They claim that the residents in the Flemington area have already given up open land for CityLink, and many residents are concerned with retaining the open space they still have. The proposed East West Link would deprive residents further of public open space – that is already in short supply in the area. The area that will be affected has a higher percentage of residents living in medium-high density housing than the Moonee Valley average. The council has a strategy in place that aims to prevent any net loss of open land in the city, and the ewlink would severely compromise this strategy. Ensure there is no net loss of open space across Moonee Valley as a whole or in suburbs where an open space deficiency has been identified. Flemington (which includes Travancore and Newmarket) is identified within the Open Space Strategy as an area of ‘open space deficiency’. Hicks for Moonee Valley also tables a plan showing the area excised from Debneys Park for Citylink, and says this is a reason residents are concerned about losing more of the park for the proposed East West Link. Hicks refers to Rose Iser’s presentation of yesterday, and adopts and highlights Iser’s comments about the community investment, not just financial, that went into creating the Debneys Park playspace. 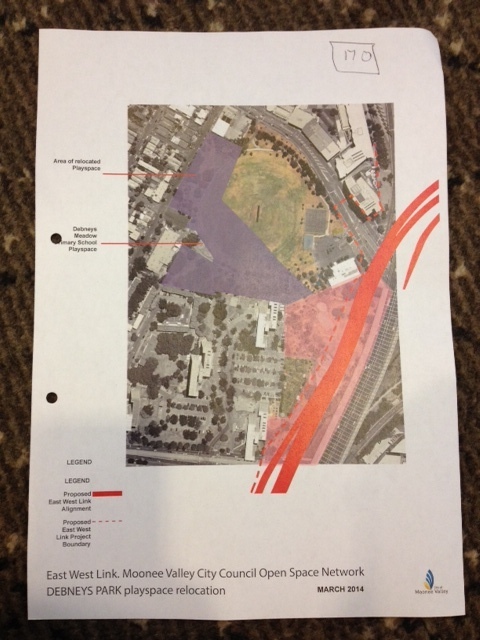 Document 170 (below) shows the area required to relocate the Debneys Park playspace locally – pink shows the current playspace area, and purple; if relocated. Hicks highlights the uncertainties arising from the proposed East West Link has put on hold Council planning for Ormond Park, Travancore Park and Debneys Park in particular.